With the growing array of radiant systems on the market today, make sure that you're picking the best possible product for your home's situation and your family's comfort. Whether it’s a new floor for the living room or new cabinetry for the kitchen, remodeling typically involves changing how the home looks. When you install new HVAC equipment, however, you are changing how the home actually feels. Putting in a new HVAC system is a key moment in your tenure as homeowner. After all, you may repaint the walls of your living spaces multiple times, but you’ll probably install a new heating and cooling technology just once, and this selection will have an impact on your daily comfort and contentment for years, if not decades, to come. How can you make such an important decision when there are so many different options? Ask a half dozen homeowners to name the best residential heating method, and you might get a half dozen different answers. Each type comes with its own pros and cons, and each fits differently into the overall landscape. 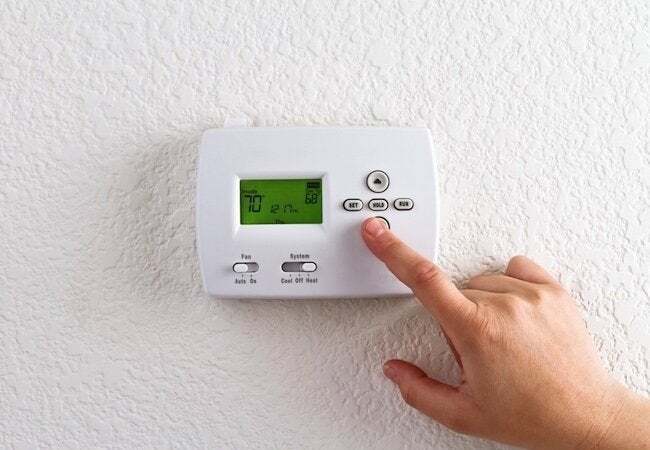 For instance, forced-air heating, the dominant mode of home heating for the past 50 years or so, is probably the technology to which most people are accustomed. Radiant heating, meanwhile, although it’s achieved wide popularity elsewhere in the world, remains relatively rare here. But that’s changing. Increasing numbers of homeowners are choosing the radiant alternative, and it’s easy to see why. For starters, radiant floor heating delivers a qualitatively different experience than the hit-and-miss level of comfort provided by traditional systems. The fact is that in a room heated by a single source—a baseboard, for example, or a radiator—comfort often proves elusive. Get too close and you sweat, too far away and you shiver. Forced air only compounds the problem of uneven heating, because such systems operate in a cyclical stop-and-start pattern that inevitably leads to uncomfortable temperature swings. And as the hot air rises, you can often find yourself too cold in some parts of the house, too hot in others. By contrast, radiant heat provides consistent, complete warmth that feels the same no matter where you are in a room. Radiant heat’s ability to create “everywhere” warmth owes partly to the fact that its components sit beneath the floor and stretch across virtually every available square foot. It’s a unique system design, one that helps create not only comfort, but also energy savings. Unlike forced air, radiant heating requires no ductwork—and ducts are notoriously leaky, compromising the efficiency of a system by 25 percent or more. By sidestepping ducts, radiant heating systems minimize (if not eliminate) heat loss, maximizing homeowners’ energy savings from month to month and one year to the next. With a radiant system, you can also look forward to a number of quality-of-life benefits. Because radiant heat is largely an “out of sight, out of mind” affair, you probably won’t be constantly aware of these improvements, but they’ll be there all the same. For example, there’s the fact that radiant heat runs at a whisper-quiet decibel level, in stark contrast to the typically noisy operation of traditional systems. As well, while conventional forced-air heating seems to supply as much dust and germs as it does warmth and comfort, radiant heating does nothing to detract from indoor air quality, making it a particularly attractive option for anyone concerned about home health. If you’re sold on the superiority of radiant heating, read on for a few considerations to bear in mind when it’s time to choose the right system for your home. There are two main types of radiant heating technologies. Though they share a handful of superficial similarities—both heat from the ground up, for example—the two couldn’t be more different. Electric radiant heating systems rely on a network of below-floor electric cables to provide supplemental heat in a room that’s underserved by the main heating system (for instance, the master bathroom). As electricity doesn’t come cheap, such systems are generally considered comfort luxuries, effective for warming the floor but not the whole home. If you’re trying to keep your entire house toasty warm, narrow your search to include only the second main type of radiant heating—hydronic. Hydronic radiant heat systems work completely differently. Here, boiler-heated water circulates through a network of tubing installed under the floor. Heat radiates outward from the tubing, first to the floor, then to the furniture, objects, air, and people in the conditioned space. Homeowners enjoy an enveloping, all-around warmth that surpasses the whole-home heating performance of traditional HVAC options. Better still, hydronic radiant heating runs primarily not on pricey electricity, but on the relatively inexpensive energy produced by an oil or gas boiler. In the realm of hydronic radiant heat, the differences between competing systems are somewhat subtle yet still important to near-term comfort and long-term savings. Much depends on the design of the radiant panels that play such a pivotal role in the success of any radiant installation. Some products on the market are essentially slabs of gypsum concrete poured over the tubing. 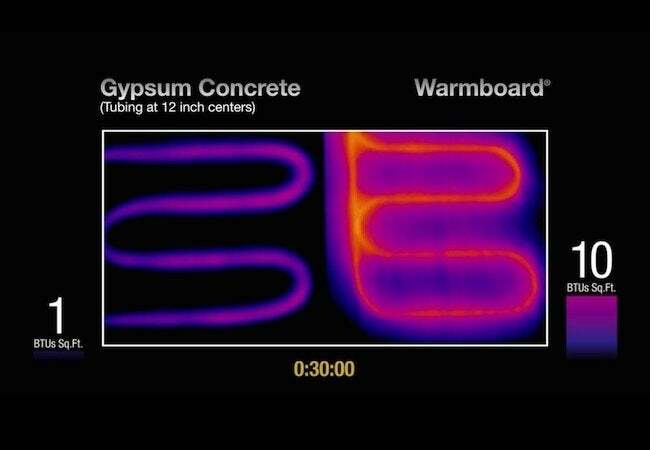 The problem is that, while not without virtues, gypsum concrete heats up slowly and cools down slowly, delaying the attainment of comfort temperatures. For greater responsiveness—and even additional savings—consider a system like Warmboard, which has panels built with quick-to-respond aluminum, a material 232 times more conductive than sluggish gypsum concrete. 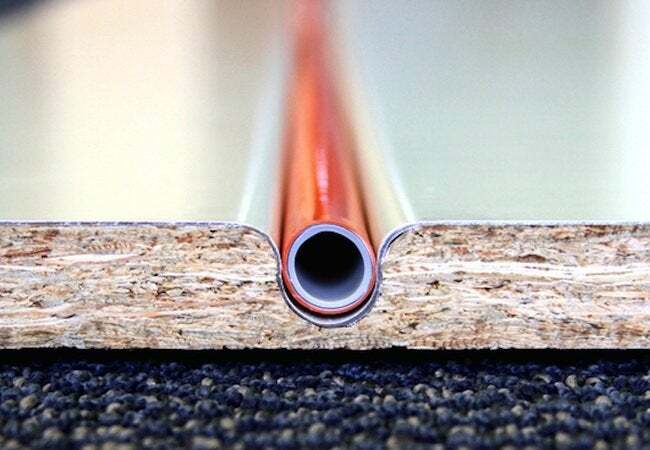 In fact, aluminum transfers heat so effectively that the Warmboard system can achieve a target temperature with water 30 degrees cooler than would be required by another system. By lightening the load for the boiler, aluminum-clad panels can save the homeowner 10 to 20 percent on energy costs—and that’s in addition to the savings achieved by choosing radiant heat in the first place. 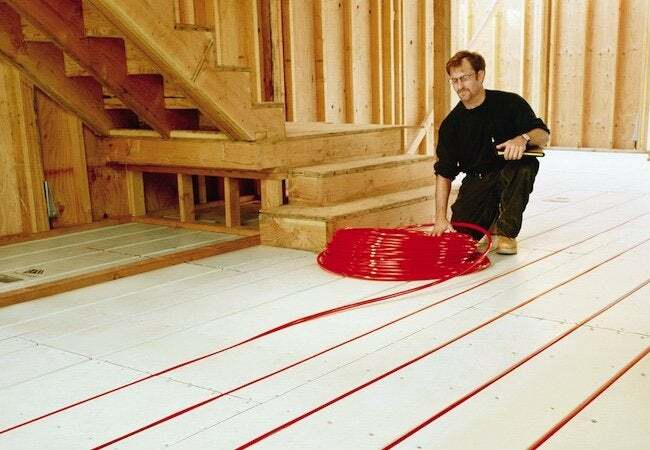 Given these challenges, it might appear that radiant heating is best installed during construction of a new home or addition, but it’s by no means impossible to retrofit a radiant system. At least one manufacturer actually offers a special type of panel that’s custom tailored for such projects. Look for ultrathin panels that slip over the existing subfloor. New construction does, however, offer homeowners the possibility of saving on the cost of materials and labor by opting for full-size radiant panels that double as subflooring. To be sure, there are plenty of big, meaningful points of contrast between radiant heat and traditional HVAC options like forced air. More surprising, though, are the tremendous differences among systems that share the same basic technology. That’s why it’s so important to compare the radiant technologies on your radar in terms of not only their price tags, but also their design and performance. After all, your family’s comfort is at stake! Fortunately, no matter which system you ultimately choose, with radiant heating you can depend on getting a clean, quiet technology that achieves total, unparalleled comfort with the utmost energy efficiency.